Sunday morning and we usually have something special for breakfast so I made pancakes, that cheered us both up. Bill discovered a leak in the forward cabin today and all his t-shirts in the lockers are soaked. It’s not surprising I think Camomile thinks she’s turned into a submarine! We’ve sailed for the last 36 hours but we are being pulled south west by the current again. We haven’t come across tides/currents like this since we left the English Channel. It’s difficult enough trying to keep as high on the wind as possible but when the current starts up it pulls the bow south making it impossible to stay on course. The wind was promised to go north of East today, which would help but it’s been promised before and not arrived. We continued to sail until 3.30 this afternoon but as soon as the current started pulling us we started the motor to try and make some easting. It seems crazy because the wind generator and solar panels are charging the batteries and we have plenty of wind to sail but we are motor sailing, it’s very frustrating. The danger as we get nearer NZ is that there are some shallow areas near the top of north Island which have some nasty overfalls and rough seas so we don’t want to get mixed up with those. The wind is rising again and we are starting to get 25kts+, which isn’t making the passage any smoother. I think we are in for a bumpy night; at least the new moon is out now. Sea temp now down to 14C and the air temp is 20C. King Neptune saved the best for last, neither Bill or I got any sleep last night. The wind was howling, the waves were pounding on the side of the boat and we were being thrown around all over the place; to make matters worse the wind went round to the south east in the night. We both managed to nap for a couple of hours each this morning. There are 2 reefs in the main again and a scrap of genny as we continue to motor as close to the wind as we can but as it strengthens it’s becoming really difficult. I think this passage will go down in our top 10 of the most difficult passages. A 900 mile beat close hauled isn’t funny. 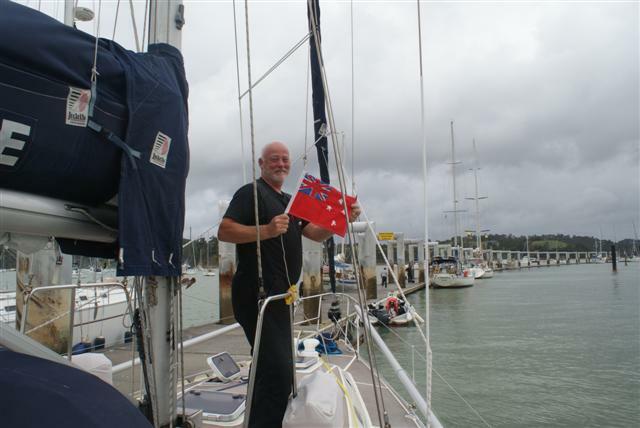 The engine was off for a couple of hours but as we got closer to NZ we couldn’t afford to drift off course so it was on just to keep us into the wind. Land was sighted at 9am this morning, which was a hugh relief. 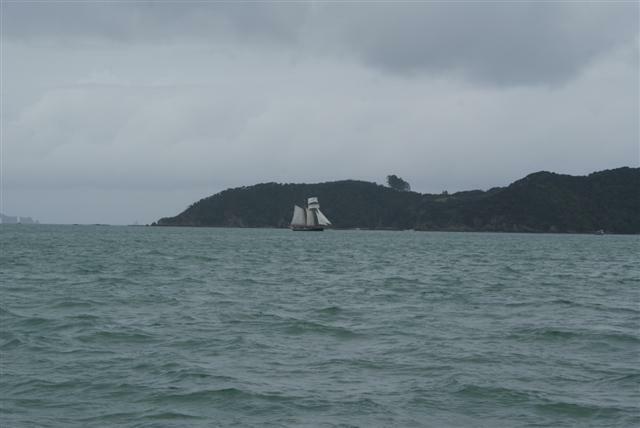 We continued sailing down to the Bay of Islands where we are checking into customs. As the sea got shallower the chop got shorter which was uncomfortable for an hour or so. 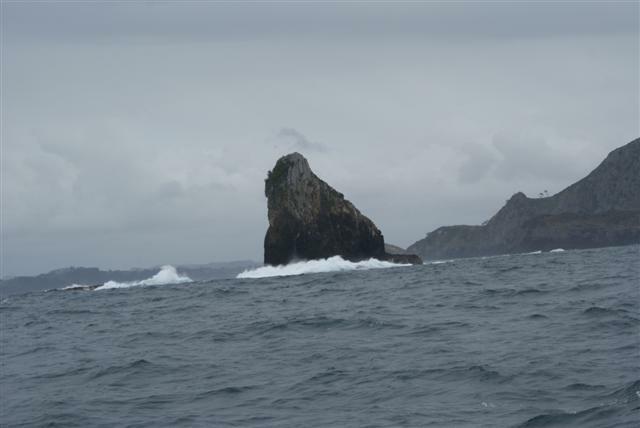 At 2pm we rounded the Nine pins rock at the entrance to the BOI and had the best sailing of the trip when we were finally upright with a nice beam reach up into the bay. We had covered 919 miles in 175 hours giving us an average of 5.25kts per hour, which is surprising considering how slow we were traveling a lot of the time. So we are in NZ, we have so many jobs to do. I’ve got shopping, washing, mend the dinghy cover, washing, mend the sail bag, update the website and more washing. Bill has a mini refit planned including replacing the rigging that wasn’t replaced last year, the genny needs repairing, replacing some of the stanchions, the fridge needs further work or replacing, the Hydrovane has got to come off because the shaft is bent, having the dinghy fixed (the tubes are coming away from the transom), replacing the bearings in the wind generator, the top gearbox on the steering needs attention to name but a few. Hopefully we’ll see something of North island as well. The weather isn’t too bad here, it’s a bit cloudy at times but at 21C it isn’t too cold. Posted on November 4, 2011, in Port posts. Bookmark the permalink. 1 Comment.